1. Meet a friend at a café. Bring post-it notes. 2. Give your friend and yourself five post-it notes each. Tell your friend to write down the five most important things in his or her life, right now, at this moment. Do it yourself. You could write anything: a person, a feeling, a place, a way of being in the world, or a value. 3. After you have both written down your five things, lay them out on the table. 4. Now, you must give one of them up. Choose the first thing you would give away if you had to. What could you live without? Then, choose the second thing you would live without. Continue discarding things one by one. 5. 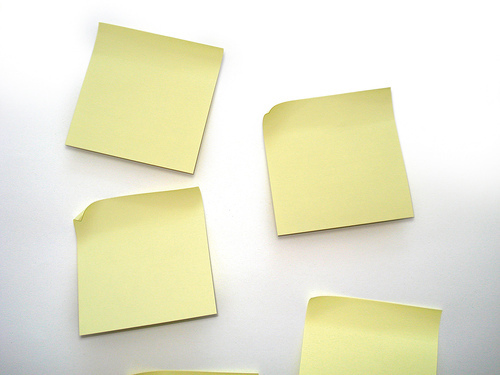 The final post-it note is the one thing you don’t think you could live without. This is your life purpose, or you could also say, the most important thing in your life. Where did this exercise come from? A new friend introduced it to me. My friend has been enormously successful as a doctor, academic, and biotech CEO, but the purpose of his life wasn’t completely self-evident to him until he went through a period of dedicated inquiry. He offered to do this exercise with me (he supplied the post-its) and explained that you can do the exercise repeatedly. The answers might change over time. He says the challenge is to live your life to truly serve that final post-it note (or rather, what you wrote in it) and to constantly ask yourself whether what you are doing is aligned with that which is most important to you. He’s on something of a mission to help other people drill down into their life purposes. He often encourages other CEOs (who think he’s crazy) to go through the post-it exercise. Their default most-important-thing is often to make money (to provide for their families), but a more specific answer is more of a guide. I won’t tell you my life purpose because it seems more interesting to let that by mysterious, but I will say, It’s been an illuminating exercise that continues to resonate. I’ve been thinking about the last post-it I left on the table a few times a week, asking myself whether the things I am actually doing, day-to-day, express what I wrote. Keeping a central theme in mind makes life feel more sacred and less random. The next morning, I couldn’t resist sharing this exercise with my roommate. And then with friends. So I wanted to share it with a larger audience, including you. Order a latte and whip out some post-it notes. Bon courage. ‹ Time To Wake Up to the Male Biological Clock? My dissertation was on how a sense of purpose develops…the more social resources we have, the more our purposes are altruistic in nature. One of my top things I can’t live without is exploration…traveling, doing new activities, meeting and exploring people…these things matter to me. Exellent post! I can’t live without my kids! To think that I would let them live with their Dad! I think not! Hope this finds you well. Kristi who-came-from-Minneapolis-for-that-book-thing-at-Mrs.Dalloways here. I started blogging myself this year (I’m convinced the world needs another blogger who will write about life, love, and TV..ha ha ha ha) and what’s funny is what I just got done writing about …my desire to figure out what to do with my life. Then what do I see over on my list of blogs that I follow? This lovely post here. I am going to do this as soon as I can. It’s brilliant! Thanks to you and your friend for sharing. Take care. What a great idea! I’ve read countless books about goal-setting and finding one’s purpose, but this is so clear, fun and right to the point. And the best part is keeping the post-it as a reminder in a place where I can see it all the time. Thanks for such a great post.